A narrow road heads south for about 1km and there is a rather unimpressive concrete building to the left and lots of parking space. Was this it? No sign of a cave or temple, although I could see monks robes hanging on the balconies of the building. 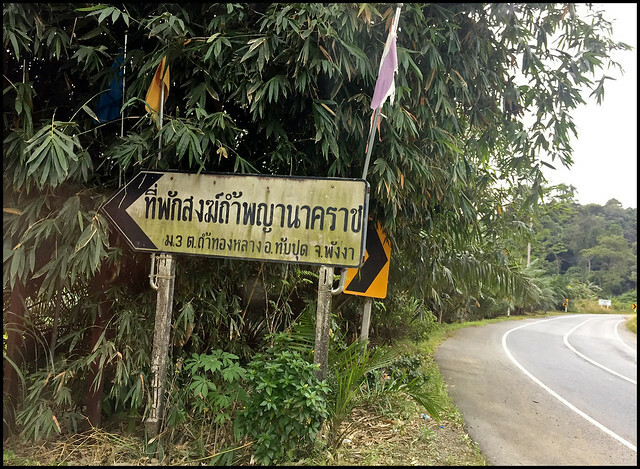 And a sign said "ถ้ำพญานาครา" .. We drove in and parked, then could see a stairway heading up the cliff. 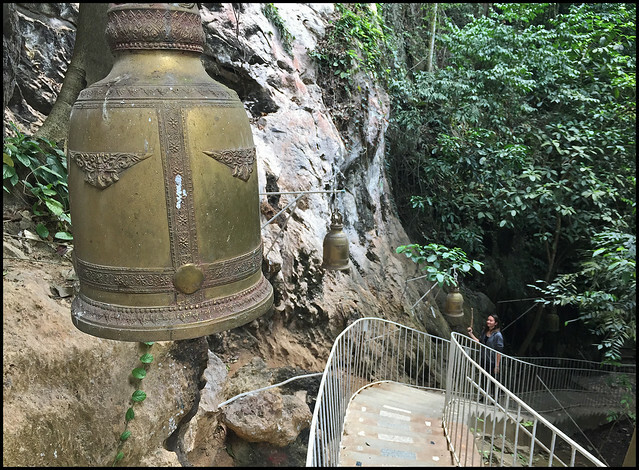 The stairway was lined with bells. I am never quite sure if I should ring these bells. Best not unless you are sure of the spiritual significance. But I rang some anyway. Hope that is good luck. At the top of this stairway we passed a doorway with a sign saying "Please remove shoes" and found a Buddhist shrine, along with a desk staffed by a young guy (not a monk), a donation box and a table of temple items for sale, and stairways heading up in 2 different directions. We took the stairs to the left of the shrine heading up the cliffside. No idea how many stairs there would be. 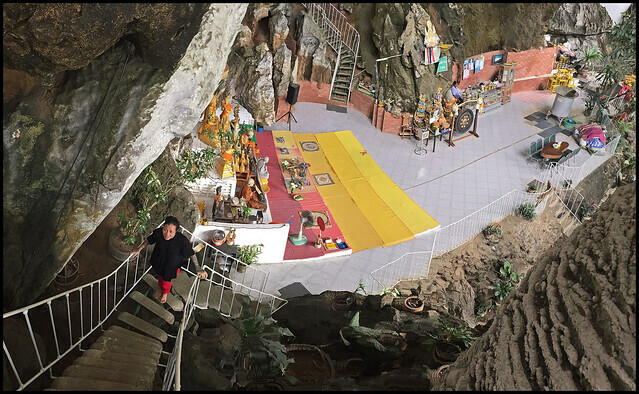 Maybe 1,000 plus like the Tiger Cave Temple in Krabi? Luckily not so many! (above) And up more steps .. not too many really! 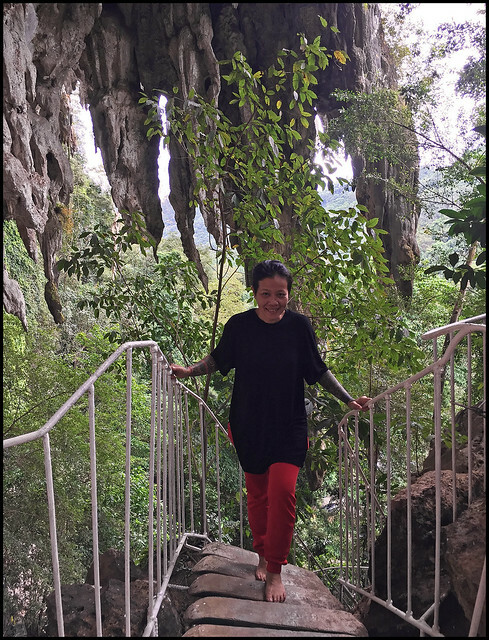 The whole place is built into the side of the cliff with giant stalactites hanging down and the jungle growing up into the cave. On this higher level you start to get some views across the valley. The floor here has been either tiled in some places or covered with sand in other places. The path is not long, maybe 100 meters passing a small chedi before you get to the "big view" with another shrine and collection of Buddha statues. Now, this is a view I could sit and admire for a while. This place is shown on the map as a monastery, or a meditation centre rather than a temple / Wat (วัด) and I think right here is a good place to meditate. And made the trip worthwhile! At this viewpoint next to the shrine is a wooden bench and a giant snake-like creature, which could maybe be mistaken for a dragon (maybe why some tour companies say 'dragon cave temple'), but this is a Naga, and not just any Naga, this is Paya Naga, the king of the snakes, leading to the name of this temple/cave. 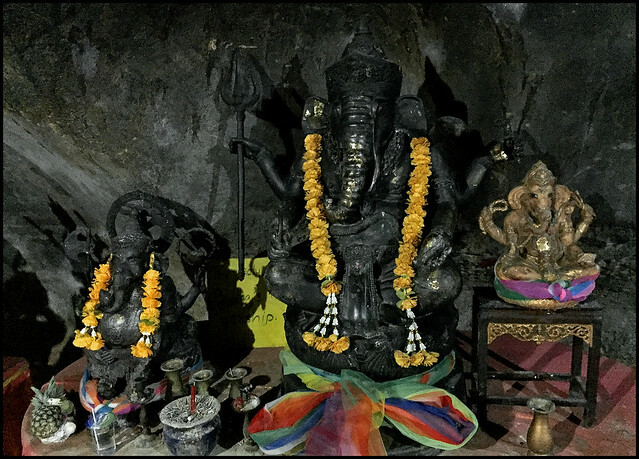 The Naga is part of Hindu myth and also Buddhism (which is related to Hinduism). So this is the cave of the king of the snakes. 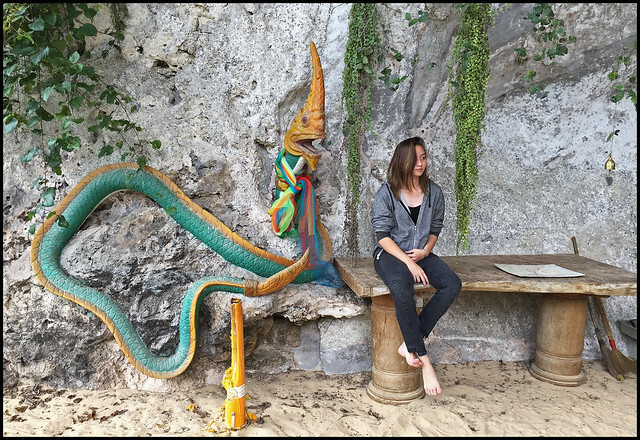 (above) My daughter with the king of the snakes, Paya Naga. We walked back and down the steps to the first level again and then up a different stairway into a system of caves which went further back than I wanted to explore due to a very rickety looking bridge which I felt might not hold my weight! 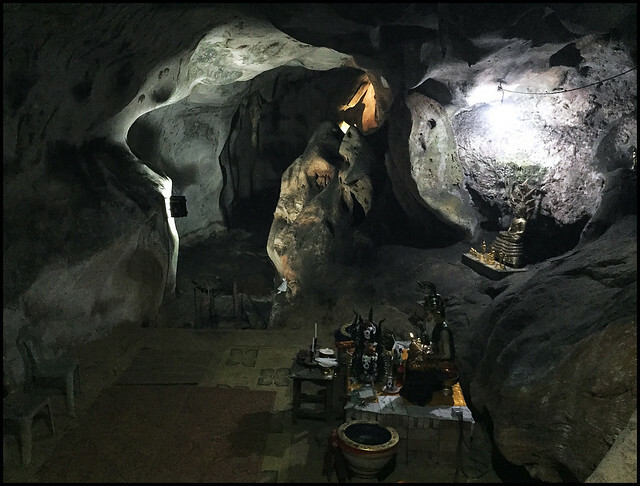 Inside the caves were shrines of Buddhist and Hindu origin. A fascinating and beautiful place. 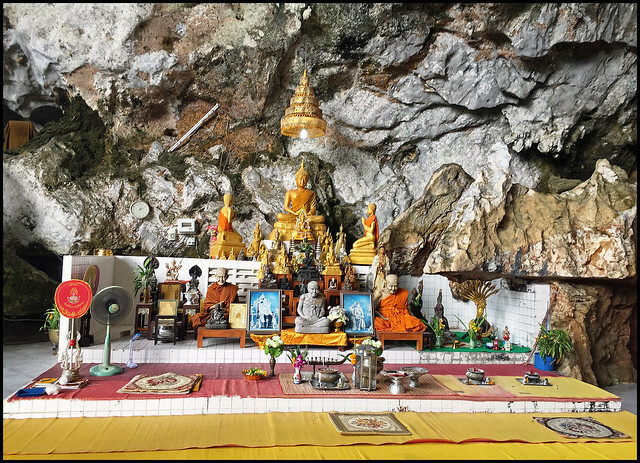 I notice on Google Maps that the small road passing this temple seems to keep going south all the way back to the main Phang Nga - Thap Put road about 5km east of the Dairy Hut Seafood restaurant. A small potentially scenic road that I need to follow one day! Very glad to have found out about Tham Paya Nakarat. Sure you might not drive all the way from Phuket just to visit this one temple, but combined with lunch, visiting Wat Suwan Kuha or Wat Bang Riang (near Thap Put town) and maybe Wat Thamtapan in Phang Nga Town and you have a selection of interesting temples in this small area.